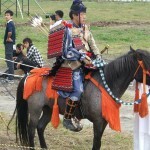 On a recent training/grading trip to Japan I was lucky enough to witness an exhibition of Japanese horse archery. I thought it would be of interest to visitors as I cannot remember ever seeing an article on the subject. This martial art is known as ‘Yabusame’ and goes back to the 10th century when samurai battles were largely decided by archery. 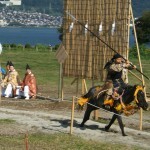 It is a common misconception that samurai battles were settled only with the katana. 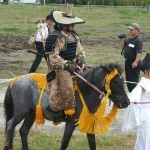 Samurai armies changed the way in which they fought throughout Japanese history, depending on strategical, as well as technological advances. 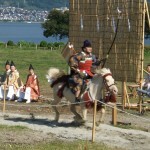 Before the introduction of gunpowder the bow was the weapon of choice for the samurai. 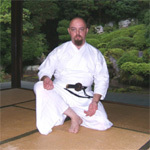 The tachi was worn edge facing down, and slung from the belt in this early period. 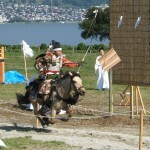 Yabusame was a battlefield art and differed greatly from the well known martial way of kyudo. 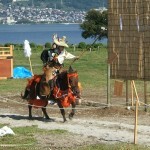 Yabusame was not only used on the battlefield, but also as a training method-and was even used to settle duels! 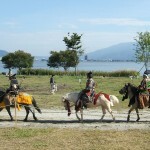 Yabusame is rarely seen in Japan now, and is steeped in the age old Shinto religion. 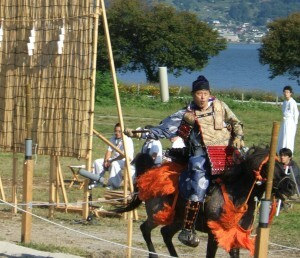 This Yabusame comes from Suwa in Nagano prefecture, and the festival displayed other arts including tameshigiri, kiari, Iaido, and Taiko. Pictures 1-6 show the archers being led by Shinto priests and various blessings being bestowed on the archers, the bows and the arrows. 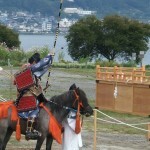 The priests and assistants from Suwa shrine performed these good luck measures for the participants, and the town as a whole. 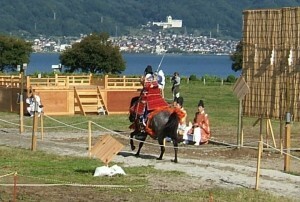 In picture seven an arrow is shot up in the air in honour of the event and to honour the gods. 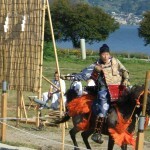 The religion of ‘shinto’ is deeply associated with the festival and the art of ‘Yabusame’. 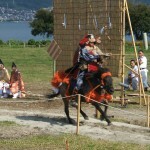 The arrows are highly prized items, especially if they successfully hit one of the 50cm square wooden targets. Even these targets are sold as souvenirs and are thought to bring good luck to the owners. 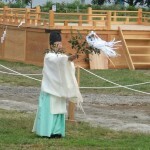 These items are often placed with ones house Shinto shrine/kamidana. Picture eight shows a warm up gallop past. 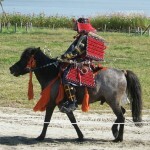 The idea is to gallop past the targets and fire three arrows –one at each target-in the ¼ of a mile path. This should be done smoothly and without stopping. This requires a high degree of skill and often the arrows are dropped before they can even be fired. It must be appreciated that whilst galloping in heavy armour, using both hands to draw and fire to your side accurately is extremely difficult. Pictures 9-16 show four of the archers galloping past and firing at the wooden boards. The boards are mounted on bamboo about 10 feet from the ground. 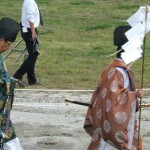 Some of the archers wore full armour/yoroi and sported the large kabuto helmet. 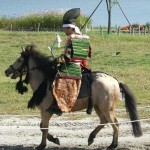 Those archers gained respect for their efforts as it is much more difficult to shoot successfully when correctly attired! 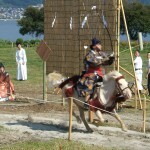 If you look closely at picture 15 you can even see the spare bow string correctly mounted below the slung tachi longsword. 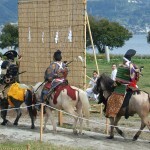 The size and speed of the horses also influenced the ability of the archers to hit the targets. As can be gathered from some of the photos some of the horses were small and slow, whilst some were large and galloped bye in a thunderous fashion. Needless to say the respect of the audience went to those who displayed this correct spirit-and not just to those who hit the targets. 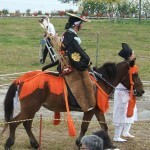 Picture 17 shows an interesting display of yari-using the Japanese spear from horseback. 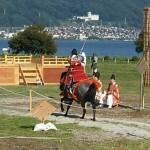 Pictures 18-19 show the tachi sword being used in mounted tameshigiri-not something which is often seen nowadays. 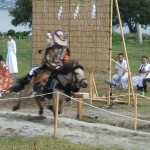 Closing ceremonies by the priests wound up this interesting series of displays.